Ceremony starts at 3:30 p.m. There is no charge for parking, but do not park in metered/reserved spaces or lots marked R1/R2. Student Registration: Like completing your degree, there are a few steps to complete. Complete the exit survey (coming soon). Even if you are unable to participate in the EECS Graduation Celebration, please complete the exit survey. 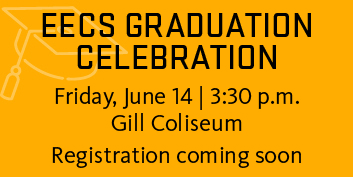 Registration for the June 14 EECS Graduation Celebration will be open soon. Check-in at Gill Coliseum on Friday, June 14 between 2:00-3:00 p.m. This event is just for Computer Science and Electrical and Computer Engineering graduates. Students who have graduated or will be graduating in Summer 2018, Fall 2018, Winter 2019, Spring 2019, Summer 2019, or Fall 2019 are welcome to participate. Students can choose to participate in the June 15 university-wide commencement, the EECS Graduation Celebration, or both. Diplomas are only awarded at university commencement. This is a cap and gown ceremony. Graduation caps and gowns can be purchased from the Beaver Store (after April 22), or borrow one from a friend. Be sure to order an orange tassel. Graduate students must also purchase a hood. Please contact us in advance should you need any special accommodations. Doors open at 2 pm. Guests should arrive early and be prepared to wait out in the weather. Seating is first come, first served. Wear comfortable shoes. You will likely have to wait in line. Expect all bags (purses, diaper bags, camera bags, etc.) to be searched by security. To speed entry into Gill, travel light. These items should not be brought to Gill. Please be advised, this is an athletics venue. Guest seating is not built for comfort. It’s our understanding water bottles and unopened bottled water is permitted. Dutch Brothers is on 26th, across from the Coliseum. Parking is free in most lots except in metered/reserved parking spaces. Do not park in R1/R2 lots. The Office of the Registrar can provide a Commencement Visa Letter to international students participating in the Commencement ceremony, in order for those students and/or their family members to obtain visas from their country's US Embassy. The Commencement Visa Letter verifies the student's graduation status, ceremony date and attendance information, and a list of invited family members.